Rosa salsa is one of the most famous sauces and as such there are a lot of variations: with fresh tomato puree, with alcohol or not, with or without onions. In short – the number of cooks matches the amount of variations. So the recipe I am giving to you today is my own variation of Rosa salsa, which is actually creamy tomato sauce that is tasty and quick and easy to prepare. There are those who tend to add vodka or white wine in order to boost the taste, I however do not believe this is the case. 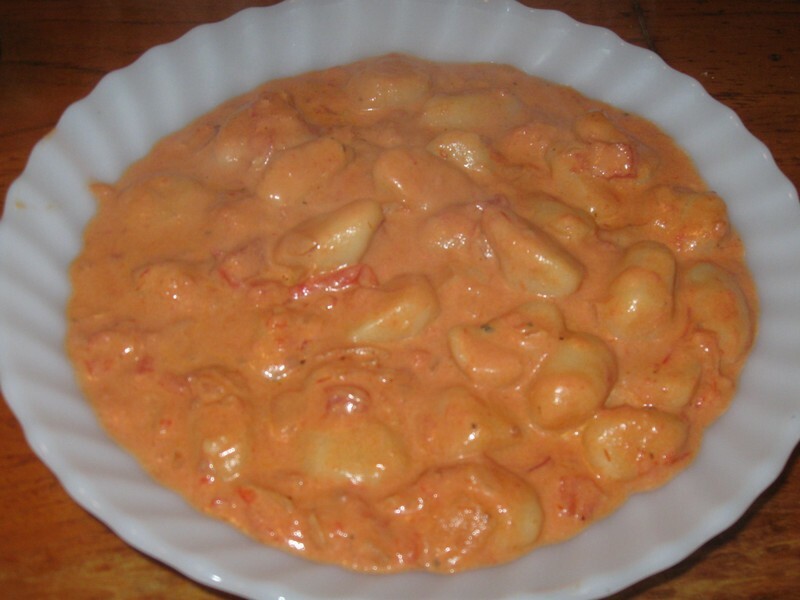 What does boost this sauce is the one and only gnocchi! Dip the tomatoes in boiling water, peel them and remove the seeds from them. Cut the tomatoes in a small bowl and put aside. Heat olive oil in a medium size. When it is hot – Put in the onion and fry until it becomes transparent. When the onion looks ready - crush into it the 2 cloves of garlic and fry for another 2 minutes. Add a pinch of nutmeg, a pinch of basil, salt, ground pepper, a pinch of sugar and stir. Bring to a boil, then lower the heat to a minimum and simmer until the sauce is reduced to 75% - 66% depending on your personal thickness preferences. This sauce is ready. Serve with gnocchi, fettuccine or any other wide pasta. 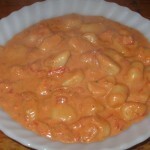 It is recommended to prepare the pasta along with the sauce (the sauce will be ready before the pasta!) and when ready - filter it and transfer it immediately to the sauce and mix inside. It is a beautiful sauce for pasta and will wrap it perfectly. So when serving - only serve pasta and coated in sauce, make sure you do not flood the dish.